RM15 OFF GrabAllStars Collection on Shopee! 1: Redeem your promo code from the GrabAllStars website: https://graballstars.com/. Select “RM15 OFF at Shopee” reward. 3: Copy your unique promo code that appears (eg. GRABALLSTAR). 4. Purchase the item (eg. 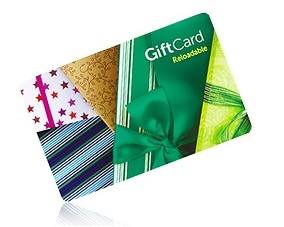 PETRONAS Gift Card) at Shopee with your promo code. 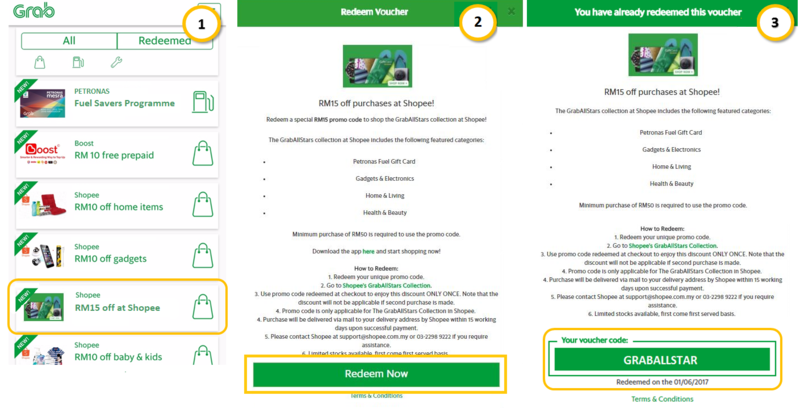 7: Paste your unique promo code to enjoy RM15 OFF, complete payment and click “Place Order” to complete your purchase! 8. You will receive your item upon successful payment within 15 working days! Valid sale duration: 24 January 2018 – 24 February 2018. Promo code can only be used ONCE during checkout. The discount will NOT be applicable if a second purchase is made. Promo code is only applicable for items under the GrabAllStars Collection in Shopee and will expire on 12 April 2018. Only Gold & Platinum Grab Drivers on the GrabAllStars platform are eligible for this special price deal. Purchase will be delivered via mail to your delivery address by Shopee within 15 working days. Please ensure that you enter your correct delivery address. Please contact Shopee at support@shopee.com.my or 03-2298 9222 if you require assistance. Limited stocks available, first come first served basis. All goods sold are strictly not returnable/exchangeable or refundable.